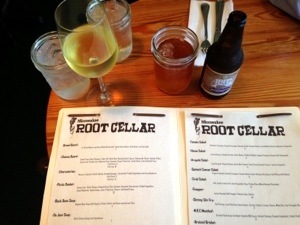 Last week I was able to take my hubs out on a date night to the Miccosukee Root Cellar. I had heard good things, but had no idea what to expect. 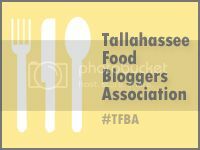 The MRC is located right next to Uptown (who I love) across from Tallahassee Memorial Hospital (where I was born, woot!). The outside is unassuming, but I was very impressed with the bright but cozy interior. We were immediately greeted and provided the menu. 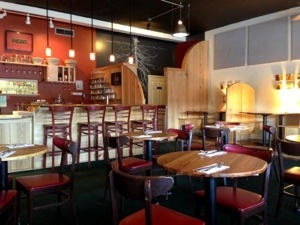 They have a delightful selection of craft beers and nice wines. My hubs got an Abita and I got a crisp chardonnay. To begin, we ordered the Charcuteries board. 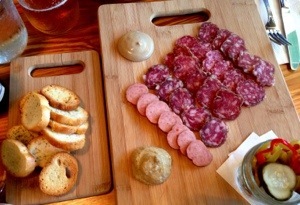 The cured meats included beautiful salame and sausage. They also provided a Dijon Mustard and a Horseradish Mustard with cute little toasts. I have to say that my fave was the pickled veggies. I may have to go back and see if I can take home a jar of the pickled okra, which was outstanding. I hated to just try one entree on the menu, as everything looked great, so I asked if the chef could make a sample plate with small portions of featured entrees. 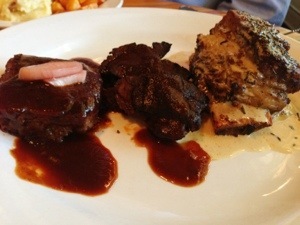 To my delight, they created a plate with the MRC Meatloaf, a special Barbecue Brisket, and the Braised Short Ribs. 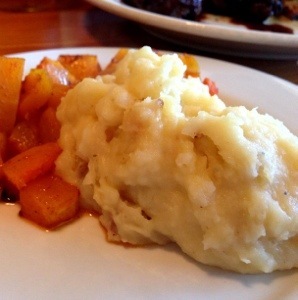 We ordered the bacon mashed potatoes and squash for our sides. If I could eat that over again, I would. Amazing. The sauces were rich and flavorful. You can taste the chipotle in the BBQ, which was incredibly deep and smoky. And the bacon mashed potatoes were everything I hoped. Pure comfort food. I was full to the gills, but in honor of our date night, we ordered dessert. (We had too!) We ordered the Bay Leaf Creme Brulee, although we were tempted by the variety of homemade organic cookes and ice creams. 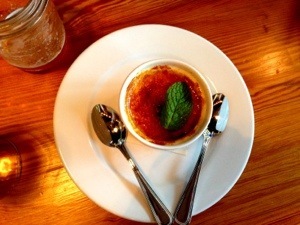 The creme brulee had a nice floral/herby note, without being to strong and was light and creamy. Really a nice way to end a meal. I loved the Miccosukee Root Cellar, and could definitely see us coming back with a group of friends to enjoy live music or just a relaxing happy hour. Check out their music calendar or the menu on their website or on Facebook!